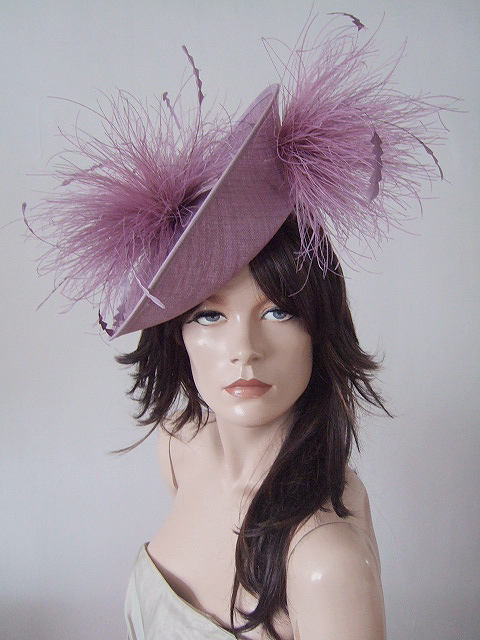 Stunning Feather Pom Pom Saucer Hat from Nigel Rayment. A medium Size Saucer with big inverted lip upwards, and dressed with Pom Poms of Ostrich hackle feathers and chevron trimmed coque also in mauve purple. Fits all sizes with the matching mauve satin Alice Band under the saucer. .
Attaches by Satin Alice Band under the Saucer.